Ships tomorrow if you order in the next 19 hours 30 minutes. Treat your body right with a multi that comes packed with vitamins, minerals and a proprietary blend of phytonutrients. 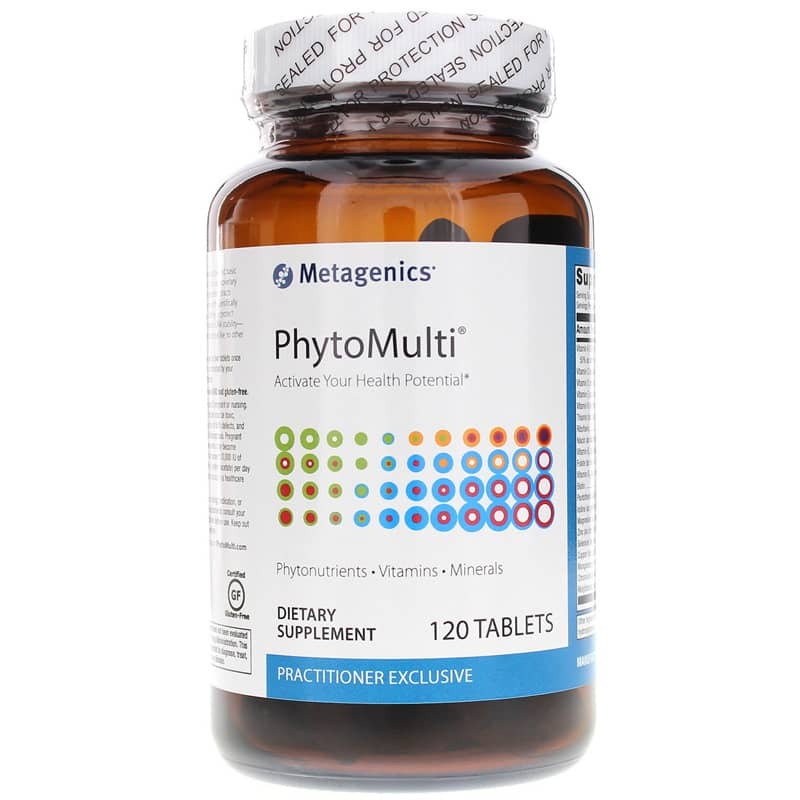 PhytoMulti Phytonutrients Vitamins & Minerals from Metagenics is designed to help you take the next step in health with optimal ingredients that can nourish and support on a cellular level. Phytonutrients, or phytochemicals, are plant-based compounds that come directly from natural sources such as fruits and vegetables. Among the many sources used to create the unique blend in PhytoMulti Phytonutrients are pomegrenate, blueberry, prune skin, green tea leaf and bitter melon. But that's only the beginning. This versatile multivitamin combines the potential health benefits of many plants into one nutrient-dense product. The vitamins and minerals used in PhytoMulti Phytonutrients are also optimized to give you multidimensional health support. For multiple benefits, get a quality multivitamin. 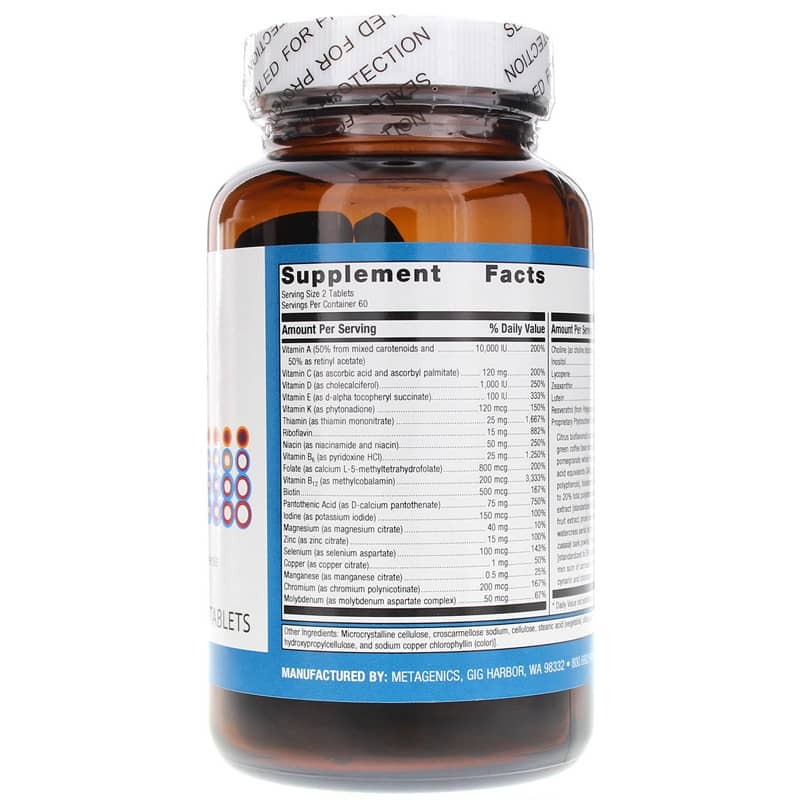 Order PhytoMulti Phytonutrients Vitamins Minerals. 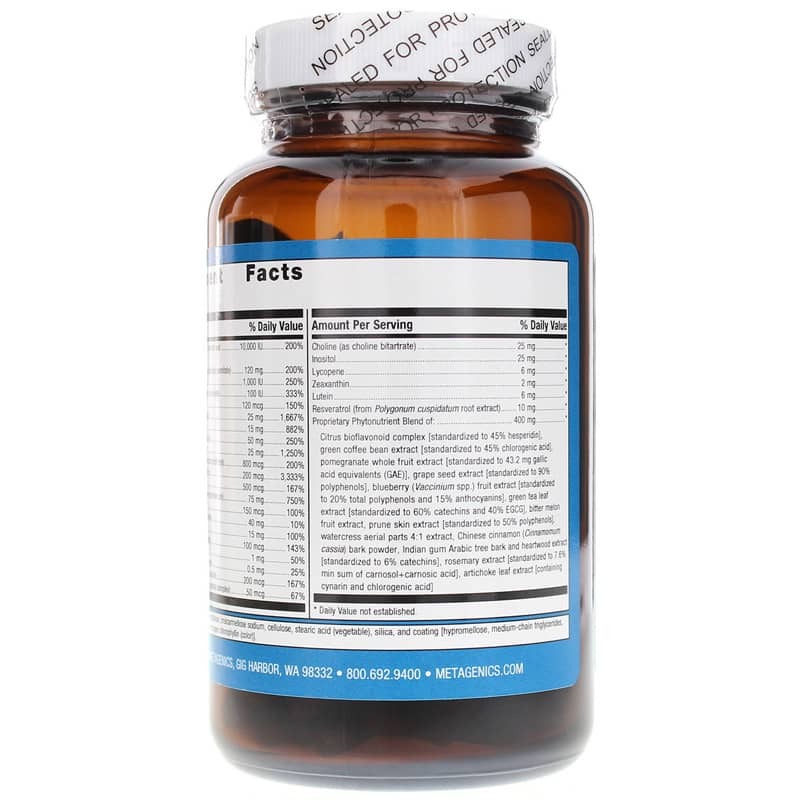 Other Ingredients: Microcrystalline cellulose, cellulose, croscarmellose sodium, silica, stearic acid (vegetable), coating (water, hypromellose, medium chain triglycerides, hydroxypropylcellulose, and sodium copper chlorophyllin). Adults: Take one to two tablets daily with food or as directed by your healthcare practitioner. Do not use if pregnant or nursing. Excess vitamin A intake may be toxic and may increase the risk of birth defects. Pregnant women and women who may become pregnant should not exceed 5000 IU of preformed vitamin A (retinyl acetate) per day. If you are taking medication, consult your healthcare practitioner before use. Keep out of the reach of children. Cost is a bit high, but worth every penny. My dietitian recommended PhytoMulti Phytonutrients Vitamins Minerals to me. She suggested that if cost is an issue to take one a day. I love PhytoMulti,and wish it wasn't so expensive. I use it for a multi vitamin and I feel that being plant based it absorbs better in my body and is natural. 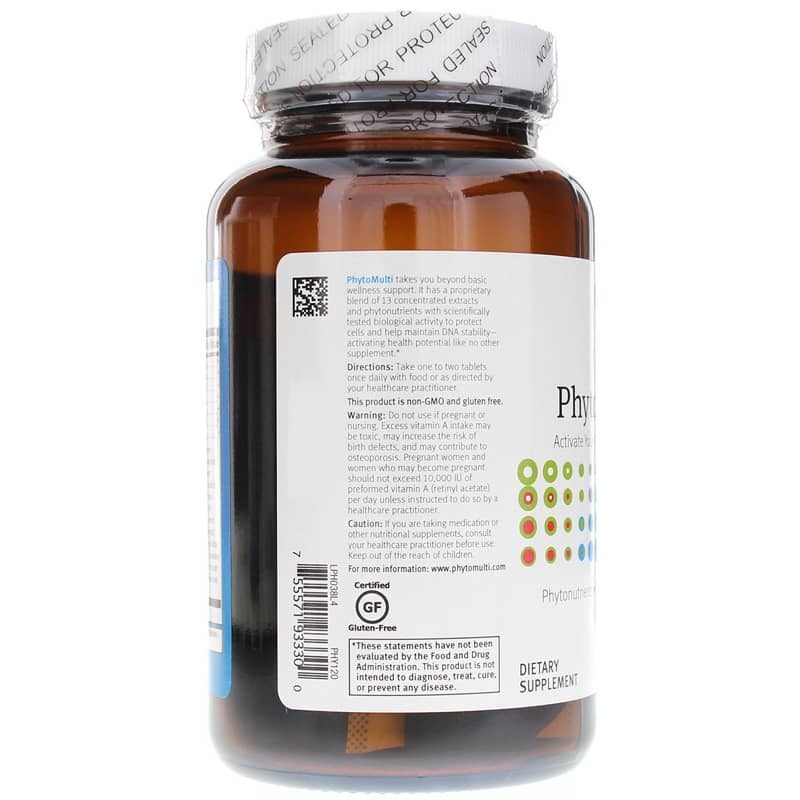 I really like taking PhytoMulti Phytonutrients Vitamins Minerals as a daily vitamin. I feel the difference and can see a difference in the way I look. They are costly though. The customer service was excellent! I needed the product very quickly and the women I spoke with was extremely helpful and professional! I was very pleased with the order I placed with Natural Healthy Concepts., very quick delivery and convenient. My husband and I have been using this product for years and absolutely love it. Ordering from Natural Healthy Concepts is a pleasure. Love the Vitamins! Phyto Multi. Easy to order with Natural Healthy Concepts. Came in a timely manner, prompt and professional staff. Thank you. Packaging was very well planned and thought out. Gives me more energy and a great self of well being. Vitamins that you can feel. Glad you carry this and give great service. Recommended this product by my non-western medical neurologist. I have many food intolerances and my body doesn't absorb nutrients well. It is gluten and dairy free and hasn't given me any problems. Great quality products are difficult to find. Thank you!